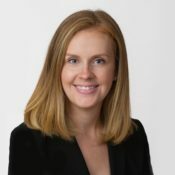 Molly focused on telecom law throughout law school by completing the Institute for Law and Technology certification program at the Catholic University Columbus School of Law and serving as Production Editor of the Catholic University Journal of Law and Technology. During law school, she interned for three bureaus within the Federal Communications Commission and spent one semester with the National Association of Broadcasters. Following law school, she worked for a general practice law firm, where she gained experience in civil litigation, employment law, and representing a government agency. Molly enjoys hiking, spending time with her two dogs, and rooting for DC sports teams, especially the Stanley Cup-winning Washington Capitals.